I’ve just returned from TMForum’s annual conference in Nice. Blockchain / distributed-ledger technologies (and even more so AI, which I’ll cover in another post) figured quite highly. TMForum Live is an event traditionally aimed at the IT-facing parts of the telecoms industry. This is usually called BSS and OSS in the vernacular – business and operations support systems, such as billing, ordering, customer service, network & fault management etc. TMF was originally the “telemanagement forum”. The event talks about top-level industry themes (5G is a hot topic, as is IoT) but couches them in terms of “monetisation” and “operationalisation”. It’s necessary back-office stuff, but sometimes a bit dry. 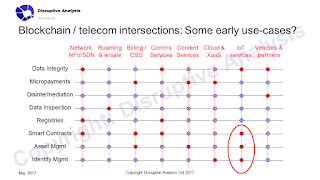 So for outsiders – such as blockchain specialists - looking at the telecom industry, the BSS/OSS sphere is a pretty impenetrable forest of acronyms, legacy software, IT frameworks and solutions to deal with telcos’ sprawling operational and customer-facing needs. It also showcases “catalysts” – joint R&D projects run by consortia of companies, highlighting future possibilities – which are a bit more accessible, with dozens of workgroups exhibiting demos and results of their work. More mundanely, the event has looked at ways to enhance the bread-and-butter costs and effectiveness of BSS and OSS solutions. Terms such as “customer experience management” and “service assurance” are everywhere, with user-centric improvements to mobile self-care apps, contact centre automation tools, chatbots, better ways to monitor network coverage and so on. This year, quite a few conference sessions and exhibiting vendors mentioned Blockchain. It definitely wasn’t as high-profile as AI and machine-learning, but it provoked a lot of curiosity. A year ago, few attendees would have heard of it, much less thought it relevant to telecoms. Now, there is an internal working group, a panel session linking Blockchain & IoT, at least one Catalyst project, and a significant number of TMForum’s members who are taking an interest. I spoke at a smaller event TMForum ran in Portugal a few months ago, outlining my thoughts about applications, and had a significant amount of interest. Device identity & authentication, especially in IoT. There was a Catalyst exhibited (link) which used a Microsoft blockchain to create unique identities for medical sensors (wearable patches), via an Ericsson IoT platform, and also involving AT&T and others. This was also used for data time-stamping and asset management. Smart contracts, both as a possible new "Contract-as-a-service" play for enterprise-facing telcos, but also as a way to offer and manage SLAs (service level agreements) for CSPs' own network services. Mobile banking and micropayments, including for IoT-type use cases such as smart electricity grids. Again, blockchains might be used by telcos to either build complete "vertical" services for end-user, or as Enabler-as-a-Service wholesale/API plays for domain specialists. I also had private discussions with vendors in Nice that covered a lot of other possible use-cases, including ones around NFV monetisation, fraud prevention, wholesale reconciliation and data-integrity protection. Another one that I've talked about before is use of distributed databases for new shared-spectrum usage and localised private radio networks - and that was independently mentioned by a speaker at another recent conference, the Wireless Broadband Alliance's congress in London. All of these areas, and others, will be discussed at the Telecoms Blockchain & AI workshop I'm running on May 31st in London. There are still some spaces available - you can sign up here (link) or email me at information AT disruptive-analysis dot com. My general sense is that development of blockchain applications in telecoms is taking a rather different evolution path to AI. There are some big “framework” plays around telecoms AI, including massive shared “data lakes” relating to customer data, network status and other variables. These can help drive more-reliable operations, better planning and happier customers who are prepared to spend more. Conversely, interest in blockchain and distributed ledgers is (for now) much more dispersed. Individual projects and functions are looking at these as solutions for “point problems” – cheaper registries and databases, ways to secure identity, whether smart contracts could help create enforceable SLAs and so forth. 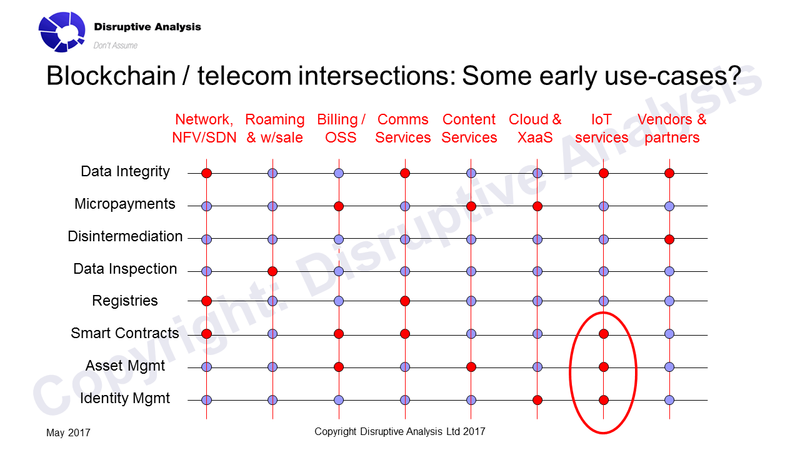 As such, it’s harder to see telcos developing a centralised, coherent “blockchain strategy” – it’s probably going to be used tactically in very isolated niches, for the next 1-2 years at least. There will be a lot of pilots and prototypes – and each domain will also have a wide range of alternative options to consider. We might see more strategic use in IoT in future, as that seems to be a focus of quite a lot of work. This fragmentation of effort also means that multiple vendors, integrators and blockchain platforms (private, but also potentially public blockchains) are likely to be relevant. As yet, there is no real centralisation of effort for telecom blockchains in the same way there is for banking and healthcare. That may be a next step, beyond the TMForum's own working group. I'm interested in others' views about this - and it's something that the May 31st public workshop (the first I'm running) should shed further light on. (Workshop details here). The more I look at enterprise mobile, especially its focus on verticals and IoT, the I'm more convinced there needs to be a change in industry structure, regulation and network ownership/operation. And that means new spectrum policy, as well. In particular, private licensed-band wireless networks will be essential - that is, networks (using cellular, WiFi, LPWAN or other technology) that can be directly managed by organisations that are not traditional MNOs (mobile network operators), to provide high-QoS, reliable wireless connections. I'm thinking large companies running their own networks, industrial network specialists, local cooperatives, perhaps new government-sector initiatives, and various other aggregators, outsourcers and intermediaries. These will mostly be in-building / on-campus, but some may need to be genuinely wide-area, or even national, as well. This is in addition to enterprise-centric initiatives in the MVNO/E space, vertical activities by fixed telcos and MNOs, unlicensed-band WiFi and LPWAN deployments and so on. Exclusive licenses: Dedicated access to certain bands is very common today, for example for mobile networks, fixed microwave links, broadcasters, satellite access and many government-sector uses, such as military radios and radar. Particular organisations have rights to solo access to particular frequencies, in a given country/region, subject to complying with various rules on power and so forth. Unlicensed: (also license-exempt): Beyond some basic rules on power and antenna siting, some bands are essentially "open to all". The 2.4GHz and 5GHz bands used by technologies such as WiFi, Bluetooth and many other technologies are prime examples, as well as bands used for consumer walkie-talkies and various medical and automotive applications. Shared spectrum: This covers various models for allowing multiple users for certain frequencies. It could involve temporary usage (eg for event broadcast), bands that haven't been "cleared" fully and still have incumbent users that newcomers need to "work around". It might be spectrum assigned in geographic chunks, or at low power levels and mandating "polite" protocols so that multiple users can co-exist. We've seen TV "white spaces" where under-used bands are opened up to others, and so forth. The latter approach of sharing is becoming much more important - despite continued clamour for exclusive licenses, especially from the mobile industry. Given that the demand for spectrum is rising from all sides - mobile, WiFi, utilities, broadcast, satellite, Internet and many others - and each has a different demand profile (global / national / regional and subscription / private / amenity etc), a one-size-fits-all model cannot work, given limited spectrum resources. More spectrum-sharing will be essential. More models are now emerging for sharing spectrum bands. Depending on the details, these open up opportunities for a greater number of stakeholders. The US' innovative CBRS model (see link) for 3.5GHz is worth examining, and perhaps replicating elsewhere, especially Europe. It is much more sophisticated - but more complex to implement - than the Licensed Shared Access (LSA) that Europe has leaned towards historically. In Disruptive Analysis' view this extra complexity is worthwhile, as it allows a much broader group of stakeholders to access spectrum, fostering greater innovation. Licensed access providers which can get dedicated slices in specific geographic areas. These are "protected" but subject to pre-emption by the top tier. They will also generate revenue for the government in terms of license fees - although awards will be for shorter periods than normal bands (3 years is being discussed). General access - basically this is like unlicensed access, but it has to work around the other tiers, if they are present. To make all this work, the CBRS system needs databases of who is using what spectrum and where, and sensors to detect any changes in the top tier's usage. (The military, as incumbents, isn't keen on spending any money to actually tell the system what it's doing - it needs to be securely automated). MVNOs wanting to "offload" some traffic from their host MNO networks, onto their own infrastructure, without the expense of full national coverage. This could work either alongside, or as an alternative to, WiFi-based offload or WiFi-primary models. Potentially, large-scale WiFi deployments in new bands, with less subject to interference than mainstream unlicensed bands - although this would require devices/chipsets supporting new frequencies that are currently outside the proper WiFi standards. Various "neutral host" wholesale LTE models, for example run by city authorities for metropolitan users, or cloud-providers for enterprise - or as a way to provide better indoor coverage for existing incumbent "outdoor" operators, without their needing individual infrastructure in each building. This could allow the pooling of back-end / administrative functions and costs across multiple local LTE networks in shared bands. Imagine an Amazon AWS approach to buying cellular capacity, on-demand. Various approaches to roaming or "un-roaming" providers - for example, a theme-park operator or hotel owner could offer its foreign guests "free LTE" while on-site. Potential new classes of cellular operator, such as an Industrial Mobile Operator (imagine GE or ABB integrating cellular access into machinery & plant equipment), various IoT platform providers, and integration opportunities with Internet, healthcare, transport and other systems. This approach may not work for enterprise wireless users requiring national (or very broad-area) coverage, such as utility companies or transport providers. There are separate arguments for utility and rail companies getting slices of dedicated spectrum, or some other model of national sharing. Importantly, CBRS means that LTE-U variants like MuLTEfire can be used to create private cellular networks. Coupled with cheap, virtualised (& probably cloud-based) core networks, this means that mobile networks are much more accessible to new entrants. The scale economies of national licenses will no longer apply to lock out alternative providers. In other words, we will see consolidation of national MNOs, but fragmentation of localised MNOs or (PNOs as some are calling private networks). While some MNOs and their industry bodies may be concerned at more competition, privately many of them acknowledge that a lot of the use-cases above cannot realistically be offered by today's industry. Even large MNOs can probably only pick 2 or 3 verticals to really get deep expertise in - maybe smart cities, or rail, or utilities, say. But they cannot get enough expertise to effectively build customised, small networks in all the possible contexts - car factories, ports, hospitals, mines, hotels, shopping malls, airports, public safety agencies, universities, oil refineries, power stations and so on. Each will have its own requirements, its own industry standards to observe, its own systems to integrate with, its own insurance/liability issues and so on. They need wireless for all sorts of reasons from robots to visitors - but today's MNOs will not be able to satisfy all those needs, especially indoors. For many governments' visions of future factories, cities and public services, good quality wireless will be essential. But it will need to be provided by many new types of providers, with business models we can only guess at. While CBRS is still at an early stage, and will be tricky to implement, we need something similar to it - with multiple tiers including a "permissionless" one - in Europe and the rest of the world. Enterprise and private cellular networks (and other licensed-band options for WiFi and LPWAN) are critical - and policymakers and regulators need to acknowledge and support this. If you are interested in discussing this topic further, I will be running a workshop day on private cellular on May 30th in Central London, in a joint effort with Caroline Gabriel of Rethink Research. Details and booking are here: (link) or else email information AT disruptive-analysis DOT com.